Ricoh is working....with Zenit on a K-1 rebadge DSLR??? Definitely not what I expected the next K-mount camera to be. If this is true, would Zenit be likely to make K-mount lenses? They made there first K-mount camera in 1984. So it isn't totally strange. Maybe Ricoh can sell them the K-mount operation. If it means hipster status and brings in money, its all good. In Soviet Russia, Zenit owns your K-mount & money. Perhaps they'll use the m42 screwmount? Or maybe not? Does the Leica rebrand have autofocus? Or are they using Leica's m39 screwmount? The Zenit trademark belongs to KMZ. Красногорский завод им. С. А. Зверева (Krasnogorskiy zavod im. S. A. Zvereva, i.e., Krasnogorsk Works named after S. A. Zverev), formerly called Красногорский механический завод (Krasnogorskiy Mechanicheskiy Zavod, i.e. Krasnogorsk Mechanical Works), hence the KMZ acronym still in use today, are a Russian factory in Krasnogorsk near Moscow which specializes in optical technology. KMZ are part of Shvabe Holding. Shvabe Holding are responsible for the development and production of high-tech optical-electronic systems, both for military and civil purposes, within the Rostec state corporation. Rostec are a Russian state-owned holding conglomerate headquartered in Moscow that specializes in consolidating in strategically important companies, mainly in the defence and high-tech industries. The Pentax K mount was used in several Zenit cameras. KMZ used to manufacture many K mount lenses which bore the Helios or Zenitar brand names. Some of them are still produced, even though it can be difficult to buy them outside Russia. Here below is a non-exhaustive list. The Zenit M is a revamped Leica M (Typ 240) manufactured by Leica and their contractors on behalf of KMZ. It's a rangefinder camera using the Leica M mount. 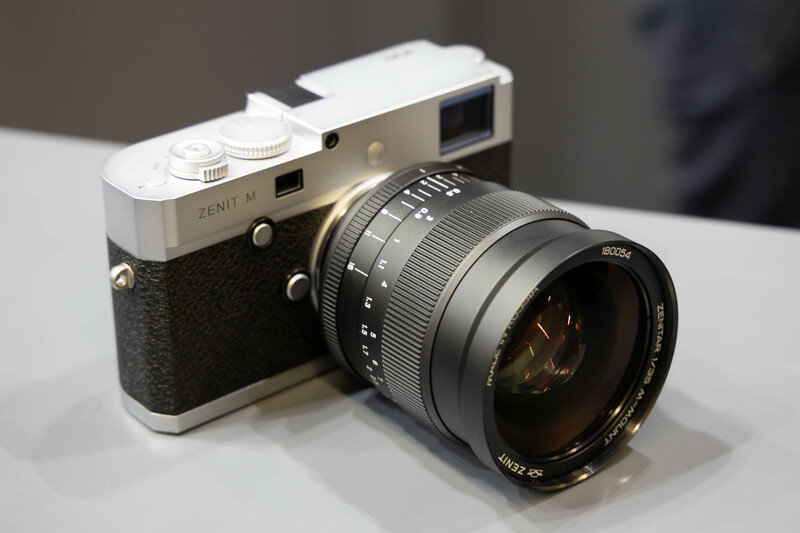 The Leica M (Typ 240) was announced at Photokina 2012. The three lenses that go with the Zenit M (Zenitar 21mm f/2.8, 35mm f/1 and 50mm f/1) are designed and manufactured by KMZ. If the same kind of scheme was duplicated, we could see a Zenit K (a revamped Pentax K-1 manufactured by Ricoh Imaging and their contractors on behalf of KMZ) together with Zenitar-K lenses designed and manufactured by KMZ. I find this as ridiculous as the Zenit-m. Why would they go into DSLR's at all? But there is no name RICOH in any interview of KMZ's managers. If it will be K-1 in body made by KMZ, it would be the same limited edition camera for collectors and for presents of friends of Medvedev. Where did you find this info? I've heard that it would be Zenit-M 50/1.0 kit and nothing else. The price of such kit is 5000-6000 euro. Haha, I think it's more like in soviet Russia, M42 screwmounts you. There is money to be made out of legacy. Some companies are supporting old products that OEM don't want to support when the type of product become out of their focus. The logic is that if Nikon, Canon, Leica etc.. develop their new product lines with new mount, there will be a legacy market left for who want to take it. Not sure about the Pentax thing. This is probably one of the weirdest rumors I've seen in a long time, but then again I thought the Zenit mirrorless FF camera was a silly rumor and they actually came out with one (despite it being a Leica M240 rebadge), so who knows?